The new PSRmini relays from Phoenix Contact are one of the world’s slimmest safety relays. At just 6-mm wide, the PSRmini allows for 6 A, force-guided safety connections, but at a 70 percent smaller footprint than standard 22.5-mm safety relays. PSRmini safety relays come in two form factors, “slim” and “compact.” The 6-mm slim relay variants have one or two normally open (N/O) safety-rated contacts, and the 12-mm compact variants have up to three N/O safety-rated contacts. The safety relays switch loads up to 6 A and are compatible with a variety of signaling devices, such as emergency stop equipment, safety-door switches, and light grids. Approvals include Performance Level (PL) e according to EN ISO 13849, and SIL 3 according to IEC 61508/61511, makes them suitable for many mechanical engineering and process industry applications. 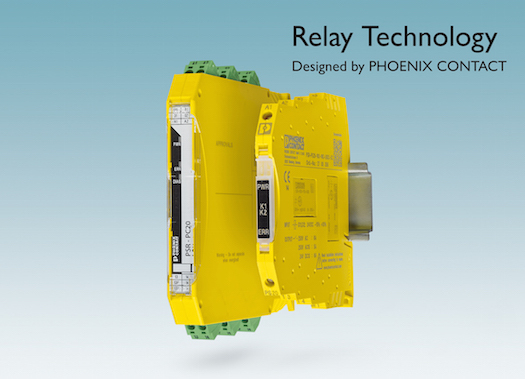 With a new elementary relay, developed in-house by Phoenix Contact, the PSRmini safety relays were able to achieve CID2, ATEX, and IECex approvals. This means PSRmini relays are thinnest force guided SIL 3-rated safety relays that can build distributed systems in potentially explosive areas. The terminal carriers also enable the use of system-cabling solutions for a fast and correct start-up and field connection.